1.1. In 1997, the Government of Kazakhstan decided to transfer its capital from Almaty to Astana (former name: Akmola), and settle a new capital there. 1.2. 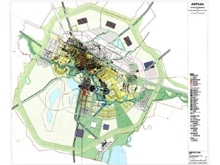 In April 1998, the Government of Kazakhstan asked architects and city planners of international renown to participate in the design competition of the new capital. 1.3. Fifty architects and city planners were invited to take part in the competition for Kazakhstan's new capital. 1.4. Finally, 27 teams participated in this competition and submitted their proposal before August 20. 1.5. The jury started on September 16, and all the proposals were displayed anonymously in the lobby of Astana's International Convention Center. The jury of experts begun on September 20, and the top three prizes were decided before September 30. 1.6. The final jury, including Kazakhstan's President, Prime Minister, and experts, was held in the Convention Center. On October 6, Kisho Kurokawa was awarded the First Prize. 1.7. The awards ceremony is planned around October 28, 1998. These were the requirements of the International Competion for the Design of its new capital. 2.1. 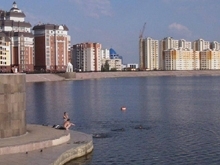 The town of Akmola, developed during the Khroutchev era as a wheat production center, was chosen as the site for the new capital. At present it is a city of 300,000 inhabitants, but the population is expected to reach 600,000 by the year 2005, and one million by the year 2030. The New capital Astana will not only use the existing urban infrastructure of Akmola, but also settle a new city adjacent to the old one. 2.2. There are several reasons for creating a new capital. Firstly it is to appeal the independence of the Republic of Kazakhstan. Secondly, Almaty, the current capital, is located near the country's border; the new capital needs to be situated in the middle of country and its transportation hub. Thirdly, creating a new-type city of the 21st Century is a way to appeal Kazakhstan as a new independent country worldwide. By the year 2030, the new capital will have a population of one million inhabitants. The Government has a 5-year plan to develop infrastructures such as airport, housing, transportation systems, etc. 3) Summary of Kurokawa's Proposal Kurokawa, since the 1960's, pleaded for the Paradigm Shift from the age of the machine principle to the age of life principle. His work is the embodiment of Metabolism and Symbiosis, which are the two most important concepts of the age of life principle. 3.1. 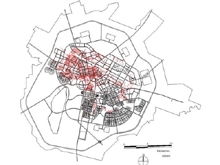 Proposal of the Metabolic City (city of growth and change) Since the new capital will go through rapid growth, Kurokawa's plan proposes a Linear Zoning System (Linear Land Use) instead of the Radius Pattern, which has a core at the center of the city. The Linear Zoning System is based on a well-balanced composition of each function of the city at every stage of its growth. 3.2 Proposal of the Master System The traditional master plans have always given a great importance to the process of finalizing the ideal form. In contrast with the traditional idea of these master plans, Kurokawa's proposal (Master System) is treating the question of what would be the city of 21st century. He proposes a new system that analyzes and reviews the situation every five years, and modifies the plan in a flexible way. a) Kurokawa's proposal aims to preserve and redevelop the existing city (its population is approximately 30,0000), and create a new city at the south and the east sides of the Ishim River, enabling the Symbiosis of the History and the Future. b) It proposes to cluster the new housings at both sides of the river, which will feature the symbiosis of the river and the city. c) It proposes a Train City (Business City), in which the existing train station will be redeveloped. A forest, extending from this Train City to the existing park, will constitute the city's central axis, realizing the symbiosis between the forest and the city. d) The existing city is a compound of various functions of the city such as housing, business, culture, leisure, and education, aiming to shift into a Symbiotic City. 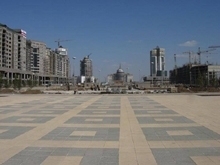 e) The Business City and the Capitol (Government City) will be developed in the south side of the Ishim River. The triangular shape of the new city center cluster will enable to interweave and live in symbiosis with the forest. f) The presidential offices, which are The Diet Building, the Supreme Court, the National Guesthouse, and the Presidential House, constitute the architecture of Abstract Symbiosis. These buildings have geometric forms simplified to their greatest extent, but at the same time, each form has all the significance of the Kazakhstan's historical symbols. This proposal aims to create the symbiosis of the Local and the Universal within the city and its architecture. a) A big balancing pond will be constructed in order to protect against floods due to snow broth of the Ishim River. At the same time, artificial lands and sky gardens will protect the new city's business area and the presidential offices. b) The ring roads surrounding the housing area are 3 meter high above from the surface, and constitute a bank. Therefore, it is possible to protect the housing area against floods even with the current land level. a) A large-scale forest is to be formed in the South of the city, in order to protect the city from dust in windy seasons. b) The manmade forest (Eco-forest) will stimulate Eco-industry, biotechnology, and Eco-Media industry. c) A recycling system will be implemented, such as garbage recycling and rainwater recycling, in order to challenge for a sustainable city of the 21st Century. 4.1. Kisho Kurokawa architect and associates and local teams of architects and experts based in Astana will form a joint team for the master plan and design of the new city. 4.2 The first stage will consist of preparing the city's infrastructure and the main facilities such as housing, the airport, the station and the business center. In the second stage, private investors including investors from foreign countries will begin the construction in the housing area and the city center. 4.3 The new capital aims to reach 1 million inhabitants by the year 2030.